Here’s the problem we had: we’d save money in our bank, but it was all going into a giant fund and we didn’t know which money was for what goal. Then we found a bank that had what we wanted, separate savings accounts. We needed a bank that would let us open mini accounts within our main account. SchoolsFirst was the bank that worked for us, but you just need to find one that has this ability. So here’s what we do now. 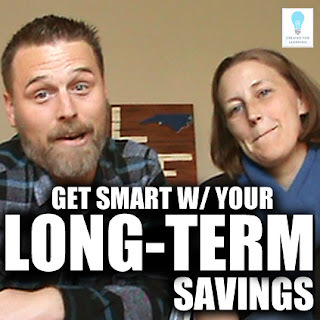 We thought up all the long-term items we wanted to save money for. Basically, anything that we’d get hit by those $500+ bombs that always make us feel like we don’t have money for them. Then we made a mini-account for each one. SchoolsFirst calls them “shares.” We planned how much we needed to save each month so we’d have enough saved when we needed to purchase each goal. Then each month when we get paid, we would immediately transfer that amount into each mini-account. And here’s the key … you can’t spend these savings accounts. Do it each month and the money will be there for you when these “surprises” come. But let’s just be honest … they aren’t surprises. We know these expenses are coming … we just need to plan for them. So our success story with this. A few months ago we wanted a new mattress. We’d spent the last 24 months saving up for it, and we went and bought it. Had all the money we needed. This month we move and needed a fridge and had more than half the amount we needed. We didn’t have all, but we hadn’t been saving long enough to have the whole amount, so we were fine with that. Then guess what, this month, we start saving for our next fridge. We hope this lead you toward some skills to help you make it through the year and those summer months without paychecks. We welcome your ideas too because we’re a community, and we’ve got lots to learn from each other. Conversation of the Day: What tips/tricks/strategies do you have to save for your long-term goals? So we’re this far into the school year, and many years for me, this was about the time my classroom management started slipping. Kids are getting a little more wired, and I need a boost. First off, it’s probably time to review the classroom guidelines one more time and ask them for feedback if the consequences are fair and working. Then crack down on those for a few weeks till those are back in line. But those guidelines alone are often not enough. And they’re certainly not fun. It’s time to start working on your street cred. What do we mean by “street cred”? Your credibility! Students love seeing that their teachers aren’t just old fuddy duddies that only care about the boring classroom stuff. You’ve gotta get out of your classroom and have some fun with them! Don’t worry, this is not a waste of time. These times are super valuable investments in your classroom management. Go play basketball or soccer with them. Eat with them for fun. Join in the karaoke at the lunch area, and if there isn’t karaoke, get your student leaders to set it up. Or get teachers to set it up and all of you do a song. Jump into the spirit competitions where you catch food off your forehead or pie eating contests. Take a chair outside and grade your papers. 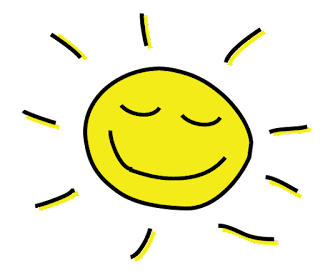 Just to look weird … And get out of your classroom into the sun. Plan a teacher flash mob dance performance at nutrition break or lunchtime. Take a role in the student play. Especially if there’s a singing part. Change into some exercise clothes and join them on the track during P.E. class. Anything really. As long as it’s creative, surprising, amazing, and even making a fool of yourself. Something outside your classroom walls. They’ll see you as human. And they’ll appreciate your humor and self-mockery. And here’s the key … when they return to the confines of your classrooms walls, they’ll be more captivated by you and be much more likely to be on your team. 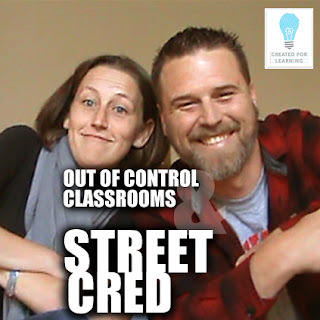 Conversation of the Day: What can you do this month to earn some street cred with your students? Vacations, house upgrades, lots of margaritas with friends … then August rolls around and you’re at Target trying to buy 3 shopping carts full of supplies and you’re worried if you have enough left in the accounts to survive the rest of summer. Because many of you have that 1 or even 2 months where you don’t get a paycheck in the summer. 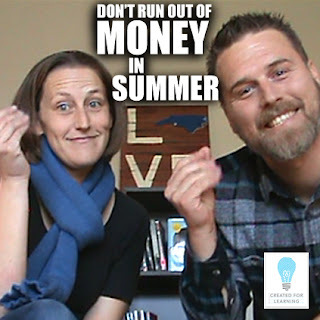 We wanted to talk about some strategies to get you through those dry summer months with no paycheck. At my first teaching job, I got paid for 10 months of work. At my last teaching job, they paid us 11 months a year. Maybe you’re like me in those two situations or maybe you’re one of the lucky ones who gets 12 paychecks a year. Whatever the case, we want to talk strategies for saving in all of these situations. 10 and 11 months … If we’re not careful, we hit those empty months and the bank account dries up and those 2-3 weeks after school starts till that first paycheck are really tough. Here’s the strategy: Take your total annual paycheck, which in North Carolina is $47,783, a whopping $10,000 less than the national average. 42nd in the nation, only 8 states get paid less, so we’ve gotta really make this work. So dig out your last pay stub and see how much you take home each month. This is where we gotta do math. Stay with us. 10 months monthly takehome = $3,600 x 10 / 12 = $3,000 … this means you’ve gotta save $600 a month away in a fund and don’t touch it so you can survive summer. 11 months monthly takehome = $3,272 x 11 / 12 = $3,000 … this means you’ve gotta save $272 a month away in a fund and don’t touch it so you can survive summer. Unless you’re like us and want to travel! So if you want to take a $6,000 trip to Europe over summer … what do you need to do? 10 months = $6,000 / 10 = $600 a month, which means you need to live on $2,400 a month … remember the money you’re saving to survive summer? Why does this have to be so hard!?! Because it is. Sure, we’d love the districts to give us 12 paychecks, but that’s not our reality. Luckily, we’re big boys and girls, and we can do this. We hope this helps get your mind thinking about how you can take charge of your money a little better. We welcome your ideas too because we’re a community, and we’ve got lots to learn from each other. 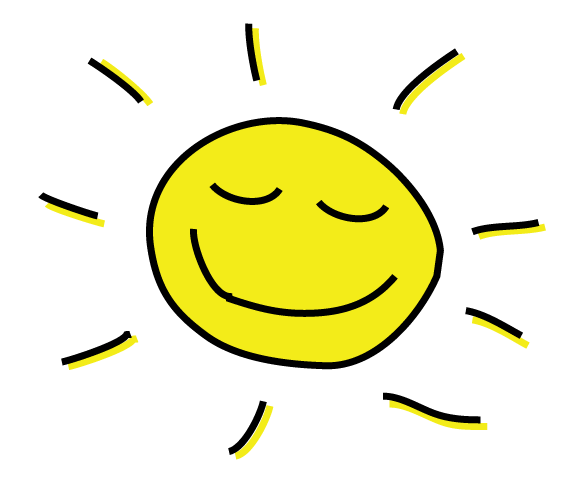 Conversation of the Day: What tips/tricks/strategies do you have to make your money last through the summer months? Teaching isn't easy. We teachers know this best. So we thought we'd ask secondary teachers the ways they are amazed by their elementary teacher colleagues. What a fun way to encourage each other! I have so much respect (and awe!) for how you so patiently deal with runny noses, bloody knees, and peed-their-pants situations! You are taking care of our kids before they can take care of themselves, and you can't just point to the door and say "Go deal with that!" like I can. You have an expert poker face. I think back to the kindergarten teacher who would pull very loose teeth, and I wince - how on EARTH did she do that so quickly and efficiently for so many kiddos? How many teachers did she save from the squeam-inducing vision of kids turning their loose teeth around? Patience. Grit. Empathy. Sheer force of will. 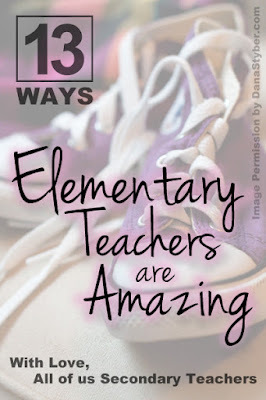 Over the years I have had many, many elementary education student teachers spend a semester working with me and I have always wondered how they could do what they do. But then they wonder about me and how I deal with over 160+ students a day. We always talked about how to keep 15-20 kids busy in 5-8 subjects everyday day. I remember my very first subbing job, an elementary first grade class - and it gave me a fear of NEVER wanting to teach. I could just never figure out how they did what they did. Yet, all my female student teacher loved what they were working towards. And as I email them today, they all seem to be happy in their choice. I have great admiration for all that you do. I'm a high school English teacher, specialized in one subject. I can sit at my desk for long periods (I don't but the option exists) and go to the bathroom when I need to. I eat with grown ups, and although I usually have to scarf my lunch down and head back to my piles of marking, I get more than a few minutes to do so. But you, you are a different teacher all together. You have to be a jack of all trades, an expert in math, English, science, geography, history, nose-wiping and shoe tying. You have to go outside at recess and negotiate through tattle tailing and tears. I get tired just thinking about the planning and juggling that must go into each and every day, a day that requires you to be a camel who gets very few breaks, even to eat your lunch. You also do such a fantastic job of preparing those little souls to move on to secondary, so we can pick up where you left off. Thanks so much for all that you do! Teaching is the only profession where it seems everyone feels comfortable telling the experts (i.e. teachers) how to do their job. So what that you studied for this in college, got a state credential, often have higher degrees and regularly attend professional development. *sigh* Elementary teachers get this more than other teachers: "Oh, you teach first grade... it must be so much fun to play with kids all day" "Right, but I mean you teach math to third graders...how hard is that?" ANYONE who thinks your job is easy has clearly not stepped foot in your classroom. I couldn't put up with this but you do. You let them know that teaching AT ANY LEVEL takes passion and expertise that not everyone has, despite the fact that they got a B in their third grade math class. Keep your chin up. We know you rock. Elementary teachers, you are rock stars. As a secondary teacher, I usually have a full plate if I have more than two to three different classes to plan and prepare for during the school year, but elementary school teachers do it all. You expertly plan the entire day for all of your students. You plan the math, the language arts, the sciences, and social sciences, and more. It is overwhelming just to think about. Planning a well-constructed, balanced day that is rigorous, engaging, fun, and inspiring requires a lot of outside planning and prep time. And for this reason, I take my hat off for all of you super star elementary school teachers out there. You definitely have your work cut out for you, and everything you do is greatly appreciated. The first time I volunteered in my daughter’s 1st grade classroom last school year, I came home and immediately took a nap. Just from volunteering, I was physically and emotionally exhausted. Her teacher was phenomenal and didn’t miss a beat… ever. She transitioned from one subject to the next seamlessly and managed to have a class of 28 six year olds completely on task. When her classroom phone rang, or a visitor would walk in, the students sat respectfully. Middle school students see that time as an opportunity to show just how loud they can be. She did all of this while having NO real curriculum to work with. She was given a scope and sequence and pretty much told to “make sense of it.” She was a veteran teacher, so she certainly knew how to teach - but this was the first year with CCSS and everything she was used to was flipped around. She didn’t look exhausted though and she didn’t complain. She just did what she had to do because…. well she didn’t have a choice. Middle school teachers can get a bit grumpy sometimes (c’mon, you know it’s true) and I never saw that side of her. I literally left her room each Friday afternoon in awe of her ability to teach that many kids, in a small room, have them be on point with their classroom transitions and procedures, all while teaching without much direction and never… ever missing a beat. Elementary teachers - I salute you and your amazing ability to literally do it all. I have SO much respect for you! As a middle school teacher in a K-8 building, I see new examples every day of your patience, creativity, and differentiation to help every child grow. But most of all, I admire the way that you make learning so enticing to children. Not only do your classrooms and activities look visually appealing, but you model so much enthusiasm! Sometimes when I start a new unit with the big kids, I ask myself how a kindergarten teacher would pitch it and make the topic seem irresistible. Cuddling. Canoodling. Hand holdings. I enjoy some laid back personal time with my wife. Unfortunately, so do the 22 kids in her classroom. Personal space isn’t something you value until you’ve received 16 hugs before 8:45 in the morning. I don’t know how elementary teachers do it. As an 11th grade teacher, I’ve never had a student try to feel the fuzziness of my khakis in the middle of an activity. Proximity is important, but please respect my hula hoop of personal space. So, hats off to the elementary teachers - I am continually impressed with your ability to handle all of those kids at your feet. But get ready - hug 17 is coming. Some of my favorite people on Earth are elementary teachers. In fact, I'm married to one! While I'm impressed with your ability to hang out with the same group of kids ALL day (not like us middle school teachers that can send out students packing after 45 minutes), I think I'm most in awe of the elementary teacher's versatility. I mean ... you teach EVERY subject. That's impressive! You adapt to the varying needs of your students with grace and kindness. Oh, and you transition between subjects, activities, and projects countless times in one day. Elementary teachers are metaphorical toolboxes with just the right tool for every situation. Thank goodness for you elementary teachers! I have had the privilege of teaching with and knowing some AMAZING elementary teachers. It is awesome to be a secondary teacher and there is never a dull moment with our BIG KIDS, but the enthusiasm of primary teachers is mind blowing. My daughter, a first grader, loves to visit her kindergarten teacher, Mrs. Bell, as often as possible. My daughter says, "I love going to Mrs. Bell's classroom in the morning. She squeals because she is so excited to see me and gives me the biggest hug that makes my feet leave the ground." Does it get any better? Because of her loving and energetic teachers, she can't wait to get to school every.single.day! It makes both my momma-heart and teacher-heart feel completely full! To those primary teachers, you are more than we could ever ask for! Thanks for taking such incredible care and giving those essential snuggles to our littles. We adore you! Simply put- you do so many things I could never do. You let them hug on you, wipe things on you, and deal with bodily fluids that I could NEVER handle. You introduce them to so many new experiences and inspire their creativity and sense of make-believe. You dress up like strange Dr. Seuss and storybook characters and leave the simple crazy socks days and hat days for me. You spend countless hours decorating your classrooms, which gives me countless hours of stress and anxiety just trying to keep up with your crazy-good interior decorating skills. You teach important life skills, like how to blow your nose, tie a shoe, wash your hands with soap and water - and I just have to remind them daily that these are skills they already possess. Thank you for preparing the middle-schoolers I teach now. You give them the foundation for which I simply build upon. You mold them into motivated learners. They are who they are because of YOU! Thank you! Elementary teachers are amazing because of their mad organizational skills! How I adore all the perfectly labeled bins, the clever ways to hang up student work, the colorful and neat classroom organizer binders, those super toolkits, the lovely crate seats, and just general order! I am constantly amazed at how you tame paper monsters, manage desk traps, and have all the other bits and pieces sorted. I pin your ideas like crazy because I truly do want to be like you. I really do want to know where my things are located so I can use them right when I want to and not have to spend a few days searching. Alas, I am a middle school teacher and organization seems to be my nemesis. I do try, I really do, but my treasures seem to multiply in spite of my efforts and no bins or closets can contain them. So my hat is off to you, dear elementary teachers,for your most excellent organizational skills! And if you need a summer project, I have the ultimate challenge you seek. I totally shout "Amen" to all the praise so far, and I'd like to add one more. I am amazed that you can be that joyful face for the same class of students all day long. You might look at us secondary teachers and think, "I don't know how you can teach 150-200 students a day," but trust me, we're looking at you thinking that we've got it made in the shade. If we've got a tricky student, we know we only have to survive for 45 minutes. But you ... you're amazing! It's easy to be patient, kind, and gentle to the little angel students, but you also get those needy, annoying, snotty, talkative, rebellious students all day long, and you love them with all your heart. Each year, there are students in your classroom that you are literally the ONE CARING ADULT in their lives. And you own that with all your love. We desire to do this too with our 8-10 times as many different faces in the day, but the impact you get to have on those kids being with you all day is truly life-changing. We applaud you, bow to you, are in utter awe of you. Keep on being awesome!